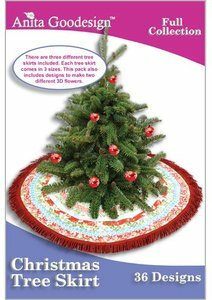 This is a first for Anita Goodesign, a tree skirt that you create on your embroidery machine. There was a lot of planning and pattern making involved when creating this collection. There are three different tree skirts and each skirt comes in 3 different sizes. There are also 2 different 3D flowers included in this collection. The flowers look great when added to the tree skirts. All of the tree skirts use the folded fabric technique for making each block. Three of the blocks are then stitched together to create one piece of the tree skirt. 15 pieces are then stitched together to complete the skirt. It's a very fast project to make because the designs don't have that many stitches in them.